There are many books about cats on the market - but no publication has ever been dedicated to the quiet work of stray cat carers in the Maltese Islands. Probably more than one thousand persons of all walks of life not only keep the many stray cat colonies well-fed, but also provide veterinary support and by neutering keep the population limited. 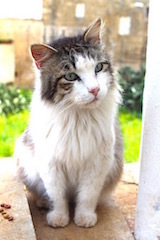 A unique phenomena to Malta and Gozo, these feral cats are in top condition and no burden for the environment and the community. Au contraire, visitors to the tourist centers of the Islands speak in favour of the furry Maltese. Written by Alexander Johnson and photos/design by Gabriele Ruttloff-Bauer, an interesting photo-story book is on its way portraying the valuable work of these devoted, volunteer stray cat carers. To keep all rights inhouse, this book will be published by Johnson and Ruttloff directly. All carer chapters and accompanying stories are well on its way, translations in Maltese and other languages to be started soon, and last but not least the printing process of Islands of Cats. This doesn't come for free, and Johnson and Ruttloff have started a crowdfunding campaign - to be rewarded by a signed copy. Your contribution is important, as part of the book's proceeds will be donated to give much needed aid to the carers, who cover all food, veterinary and neutering expenses out of their own pockets. Thank you very much for your consideration ! !